Monday saw the last day of halibut fishing for 2010. There were a number of boats on both Sunday and Monday giving it one more shot. Now we put away our anchors and heavy rods, and wait to find out when the 2011 season will open. The salmon fishing in Sooke continues to be quite good. 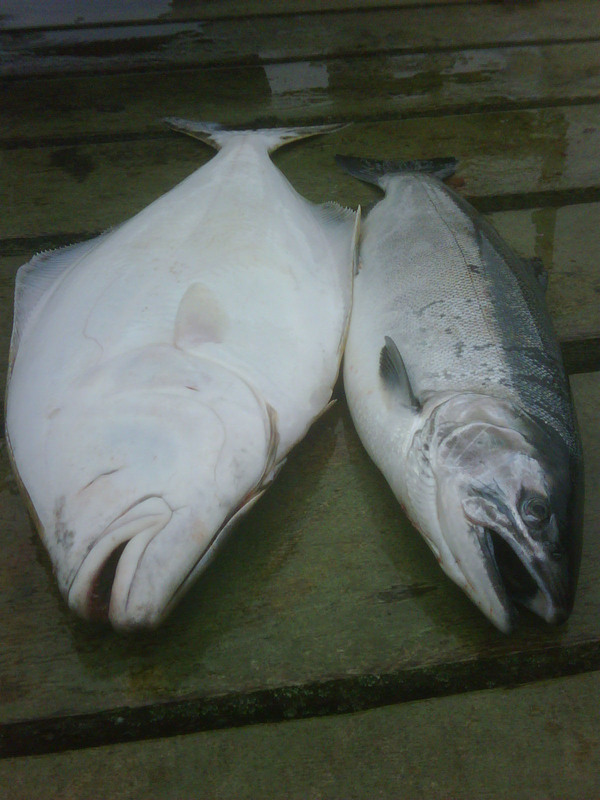 There are still coho around, reported from 200-500 foot depths, mostly caught 1oo feet or deeper. A few large ones pushing 20 pounds have been caught, though mostly are 8-12 pounds -- lots of fun with these scrappy salmon, especially if you use smaller flashers and lighter gear. Anglers have had success with white hootchies and green/glow spoons. Anchovies in a bait holder work too....these coho are hungry, and if you go through a school, they will probably take most anything. Some people are catching chum salmon in the teens too, when they slow down, sometimes when slowing the boat to play another fish. The winter springs are also here and of decent size, 10-12 pounds. These are fished near the bottom in 130-150 feet, usually from Possession Point/Secretary to the Wells-o-Weary trailer park towards Otter Point. Anchovies work, but most anglers use hootchies ... less work and just as much success! The weather has generally been nice and calm lately, not much wind and some sunny days. Though it looks like some bad weather is coming for the weekend, especially towards Victoria, so keep a close eye on the forecasts. Have fun, play safe!